When you create a chart embedded as a ChartObject, it is a good idea to name the ChartObject so that it can be easily referenced in later code. When you select the chart, you will see its name to the left of the Formula bar at the top of the screen in the name box. You can select and change the name of the ChartObject in the name box and press Enter to update it. The embedded chart in Figure 8-4 was created, dragged to its new location, and had its name changed to MangoesChart. The name can also be changed in the Layout tab of the Ribbon by clicking the Properties button. 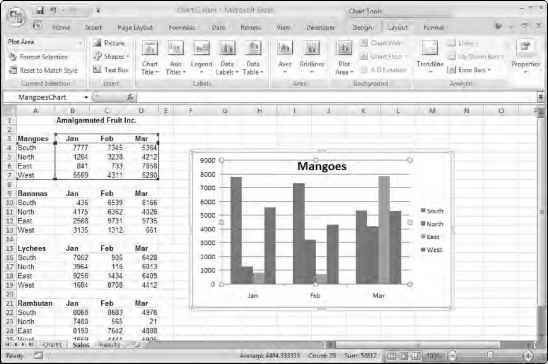 The chart was created, using the Insert tab of the Ribbon, by clicking the Column button and selecting the top-left chart type from the 2-D Column section of the resulting dialog box. The name was changed in the name box. The row/column orientation was switched in the Design tab as before. The title was added by activating the Layout tab of the Ribbon and clicking the Chart Title button in the Labels group and choosing Centered Overlay Title.